The transfer gossip columns at the moment are dominated by some truly outstanding young players who could be poised for big moves to the likes of Manchester United, Chelsea and Barcelona this summer. 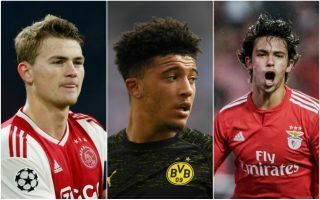 While top clubs are always on the lookout for the next big thing, this seems like a particularly exciting generation coming through at the moment, and many of them could be heading for Premier League clubs in the near future. Linked with Manchester United by the Evening Standard and a host of other sources, it is little surprise to see Jadon Sancho is one of the most talked about young players on the planet at the moment. The 18-year-old England international has been a big hit in Germany, lighting up the Bundesliga with his performance for Borussia Dortmund that could yet earn him a title. As well as that, they could also earn him a big transfer to Man Utd in a move already potentially worth £80million, according to the Standard. Linked by the Guardian with Bayern Munich back in January, it’s clear Chelsea have themselves an elite young talent in Callum Hudson-Odoi. Unfortunately for them, they seem to be struggling to keep hold of him as he’ll be in the final year of his contract next season. Borussia Dortmund could also join the running for the 18-year-old’s signature as the Daily Mirror link him as their preferred replacement should Sancho join Manchester United. A prolific scorer and huge talent aged just 21, Luka Jovic is another young player to look out for as transfer speculation hots up over his future. Goal have linked the Serbia international with Chelsea in a move that makes sense for the Blues as they seek to solve their goal-scoring woes. Gonzalo Higuain hasn’t looked the most convincing since joining on loan from Juventus, and Jovic could be the ideal long-term replacement. Still only 19, Joao Felix is having a sensational season for Benfica and looks the next big thing coming out of Portuguese football. Diario Gol have been among the sources to link Felix with Europe’s elite, stating Manchester United, Real Madrid and Juventus are among his suitors. It would no doubt be exciting to see if this Portuguese wonderkid can go on to replicate Cristiano Ronaldo with a move to a European super club at a young age.